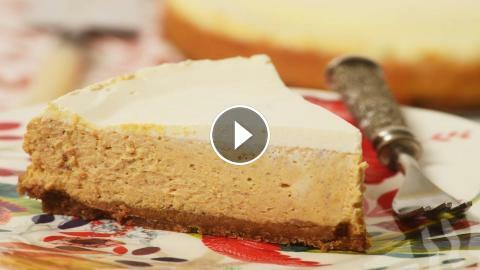 Recipe here: Stephanie Jaworski of Joyofbaking.com demonstrates how to make a Pumpkin Cheesecake. This Pumpkin Cheesecake has three layers. It starts with a ginger flavored Graham Cracker Crust. Next, the cream cheese filling combines a New York style cheesecake with the earthy flavor of pumpkin puree and its complementary spices. The cake is finished with a smooth layer of vanilla flavored sour cream. This dessert is excellent any time of the year, but it's particularly nice in the Fall.